Have you ever heard of memoirs? No, not Memoirs of a Geisha, though i must admit that Zhang Ziyi is quite hot in that movie. A memoir according to http://inkspell.homestead.com/memoir.html means that it is "a piece of autobiographical writing, usually shorter in nature than a comprehensive autobiography. The memoir, especially as it is being used in publishing today, often tries to capture certain highlights or meaningful moments in one's past, often including a contemplation of the meaning of that event at the time of the writing of the memoir." I have decided to write a memoir of my own too, since an article in Reader's Digest suggests that memoirs is good for your health, how its good i cannot remember, but who cares anyway? I am banking on my memoir to be adapted to a movie like Memoirs of a Geisha and then i could be rich and famous! But of course, what is a good memoir without a good title and a great storyline? From what i have read, a memoir must be based on reality, so i guess i could not be really writing on how i discovered i am superman and it also must contain "highlights or meaningful moments in one's past." And based on what i see, most of the bestselling memoirs have titles like "Thirteen Days: A Memoir of the Cuban Missile Crisis", "Accidental Journey: A Cambridge Internee's Memoir of World War II" or even "Almost a Woman". Which means i have to either encounter a Missile Crisis in Malaysia, or wished that i am still alive when World War III happens or i have to undergo an operation to be a female if i want my memoir to be made into a film since the biggest adventure i ever had in my life was getting lost in a supermarket. Gosh, i never knew writing a memoir could be so hard work. 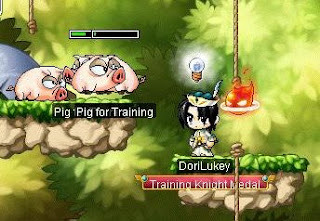 What if my memoir was to be based on the MMORPG game (Maple Story) that i always play? "My name is DoriLukey. Its is a combination of Dori and Lukey, with Dori taken from the word Doriyaki, Doraemon's favorite food and Lukey from the name Luke. Which basically means that my parents were huge fans of Doraemon and not to mention Star Wars, and decided that a "Y" would go really nice with Luke. I live in a world call Maple World and for the past few hundred of billions of kazillion years, life have been relatively peaceful. Until that i was told one day by the Maple Adminstrator that someone by the name Black Wizard (Can't they think of a more original name?) is coming back to life. Like the name suggests, Black Wizard is definitely not a good guy and it seems to me that the Maple creators have nothing better to do than to always think of ways to make life miserable for us Maplers. " And there goes the opening of my story. If you want to read more about it, you have to go looking for it near bookstores near you. That is if i could find someone to first publish my memoir, not forgetting someone to adapt it to a movie.